We are honoured and privileged to welcome President Danny Faure on his first State Visit to India. India and Seychelles share a special relationship. Our strategic convergence has been built on the foundation of our shared values and common aspirations. Our relationship has flourished over the years across various spheres. As maritime neighbours, we are committed to securing our oceanic space for sustained development. Securing our seas will ultimately lead to creating a peaceful environment for the progress and prosperity of our two countries and peoples. It forms part of our SAGAR vision articulated by our Prime Minister – an acronym that denotes "Security and Growth for All in the Region”. India and Seychelles have always been strong security partners. Indian Naval ships are regularly deployed to undertake patrol of the extensive Exclusive Economic Zone of Seychelles. India also remains committed to support Seychelles through capacity building, especially in the field of maritime security. 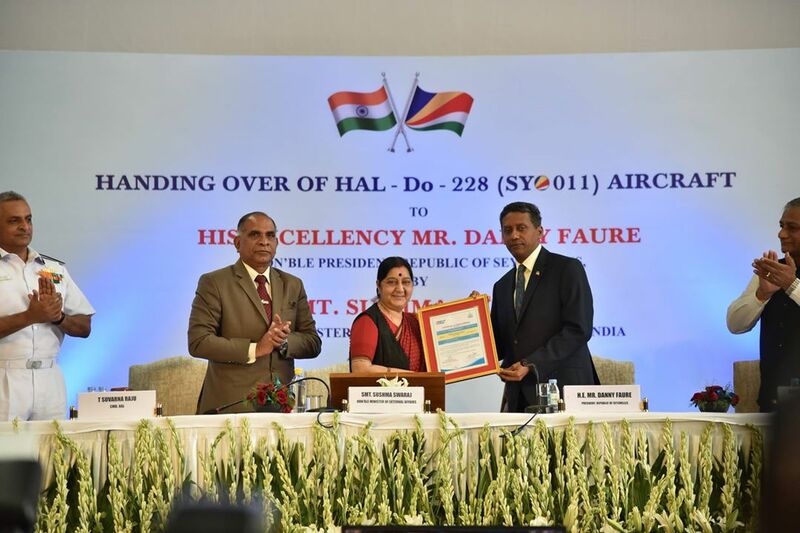 To enhance the surveillance capability of Seychelles to tackle maritime threats, our Prime Minister had announced the gifting of a second Dornier aircraft during his landmark visit to Seychelles in March 2015. Today marks a historic day with the fulfilling of this commitment by handing over of this world class and state-of-the-art second Dornier aircraft to the Republic of Seychelles. It is gift from India ahead of the celebrations to mark the National Day of Seychelles on 29th June. I am sure, this aircraft will give a quantum enhancement in maritime reconnaissance and contribute towards keeping the vast EEZ of Seychelles free from maritime threats. With these words, I wish the Dornier a smooth, turbulent-free flight across the waters that link our two countries. I also wish President Danny Faure and the people of Seychelles warm greetings and felicitations on the occasion of the National Day of Seychelles.